Cresswell's pedigree, took Samuels parents to be John from a tattered handwritten pedigree Pg 371 Alstoniana, there was some contention at the time (1898) from others in the family over this view, Dr Fenn pg 357 Alstoniana. A portrait of a John Alston  born c1680, living 1754, hung in hall of Alston Court (Grooms) Nayland, Cresswell had him as a half brother to Samuel, father John Alston of Edwardstone, bap 1666 Newton, IGI puts his mother Elizabeth Harris. Had issue John, Thomas, Jacob. Mary (Martha) Stock of Wethersfield remains unaccounted for, as does Samuels birth and Samuel and Sarah's wedding. No record in the IGI, or in Edwardstone or Gt Waldingfield registers, or Boyds Marriages in Suffolk or Essex. A John Alston (943) assigned to Samuel Alston of Edwardstone Maltster a messuage called "Snows" on the 27 July 1731. At this Court came Samuel Alston of Edwardston in the County of Suffolk Maltster and Informed the sd Court that the Principal money or sum of two hundred pounds secured to the sd Saml Alston from John Campion one of the Customary Tenants of this Manor by a certain Conditional Surrender after a Recovery Suffered by the said John Campion at a Special Court held for the tenant aforesd on Tuesday the one & Thirtieth of January now last past of a Customary or Copyhold Messuage or Tenement Situate lying & being in Groton aforesd in a certain street there called Boxford Street with the House Stables Outhouses Yards Gardens & Orchards to the same belonging with the appurts formerly in the tenure or occupancy of Joseph Whiteing or his Assigns & now in the tenure or occupation of the said John Campion his Assigns or Assignee and all & every other the Messuages or Tenements & lands & Residences whatsoever of him the said John Campion now of the sd Manor by the sd Court Roll and is still due & unpaid to the said Saml Alston AND THEREUPON he the said Samuel Alston humbly prays of the Lord of the said Manor to be Admitted Tenant to all and every his said Messuage or Tenement & pledges with his Appurtenances to him Surrendered by the said John Campion as aforesaid To which said Saml Alston his Lord of the Manor by the hands of his said Steward did Grant and deliver Seisin thereof by the Rod TO HOLD to him the sd Saml Alston his Heirs & Assigns forever of the Lord by the Rod at the Will of the Lord According to the Custom of the Manor by the Yearly Rents & Services therefore due & of right Accustomed SUBJECT nevertheless to the power & Equity of Redemption to him the sd John Campion his Heirs & Assigns in & by the sd writes [rights] Surrender reserved mentioned & Expressed & he gave the Lord his ffine and was thereof Admitted tenant the right of every one being Saved & so forth.
. . . . . Lord according to the customs of the sd Mannor by the Rents & Services thereof due and of right accustomed but his ffine was excused and his ffealty asserted AND AFTERWARDS at this Court came the sd George Baker in full court and Surrendered by the Rod unto the hands of the Lord by the hands of his Deputy Steward according to the custom of the Mannor aforesd SETT THAT the aforesd. Messuages or tenemt with the lands and the appurts at this Court Surrendered as aforesd TO the life and behoof of him the sd. John Campion and his heirs forever which said John Campion being present here in Court humbly prayed of the Lord to be Admitted Tenant to the premises aforesd with the appurts to whom the Lord of the said Mannor by his Deputy Steward did declare thereof Seisin by the Rod TO HOLD the same forever with the appurts to him the sd. John Campion and his heirs forever of the Lord of the sd Mannor at the Will of the Lord According to the custom of the said Mannor by the Court Services thereof due and of rights Accustomed and he gave the Lord his ffine and did him ffealty and is admitted thereof Tent. And so forth AND afterwards sitting the Court the aforesd Thomas Mills George Baker and Jermyn Moyle in Open Court before the Homage by the Rod Recognised Released and forever quit claims to the aforesd John Campion in his Actual possession & Seisin now being and to his seisin forever. SETT the Estate Right Title Interest Property Claim and demand whatsoever of them the sd Thomas Mills George Baker and Jermyn Moyle & every of them of in and to the same premise and every part and particle thereof so that neither they nor any of them nor their or any of their heirs any Estate right Title or Interest forever of in or to the premises aforesd or any part thereof from . . . . . shall have claim or seisin and by of and from the same but are and shall be wholly there from Excluded henceforth and ever debarred. AFTERWARDS the sd John Campion still sitting in the full and Open Court Surrendered by the Rod the hands of the Lord of the Mannor by the hands of his deputy steward and All and singular his messuage or tenement lands & hereditaments and premises aforsd with the appurts To the only life and behoof of Saml Alston of Edwardston in the said County Samuel Alston his heirs and assigns forever. Upon this condition nevertheless that of the sd John Campion his heirs Extors Adms & aforesd send one or two of them do and shall well and truly pay or cause to be paid unto the said Saml Alston his heirs exetors Adms or Asss some or one of the full and Just Sum of one hundred pounds of good and lawful money of Great Britain with lawfull Interest for the same on the twenty sixth day of October which shall be in the year of our Lord one thousand seven hundred & thirty seven at or in the now dwelling house of the sd Saml Alston situate and being in Edwardston aforesaid without fraud or coin then the same Surrender to be void or else to be and remain in full forte power and virtue AND AFTERWARDS sitting the said Court the sd John Campion in Open Court did Surrender by the Rod unto the hands of the Lord of the Mannor by the hands of the sd deputy Steward according to the Custom of the sd Mannor SETT and every those messuage or tenement lands hereditaments & premise to which he was just now Admitted to and for such use and used as are or shall be declared in and by his last Will and Testament. The rest of the Roll relates to other Court business. It appears to this Court that on the 13 day of May last between the hours of two and three of the clock in the morning a fire broke out in the Kiln belonging to the Malting Office of Samuel Alston the Elder of Edwardstone in the said County which totally destroyed the roof and the malt chambers and thereby the malt of eighty quarters of barley. WHEREAS by Articles of Agreement bearing the date the first day of September Anno Dui 1730 made between him the said John Alston the Elder of the one part and the said Samuel Alston of the other part he the said John Alston the Elder did demise and to . . . . . lett unto the said Samuel Alston all those two Messuages or Tenements with all and singular the houses and outhouses buildings . . . . . stables gardens orchards fruit trees ways ponds waters . . . . . passages. . . . . right of common thereunto belonging AND also all those three closes and fields of arable land thereunto near adjoining containing by estimation six acres be the same more or less AND also all that meadow or pasture ground containing by estimation five acres be the same more or less AND also all that close or field of arable land containing by estimation seven acres called Grovefield or otherwise with the appurtances AND all that field commonly called Thornfield containing by estimation six acres by the same more or less As all and singular the same premises late were in the . . . . . or occupation of the said John Alston the Elder or his Assigns and are situate lying and being in Edwardstone aforesaid To hold the same Premises to him the said Samuel Alston his Executors and Administrators from the feast of St Michael the Arch Angel thou last passed for the Term of 31 years from . . . . . . . . . . ensuing at & under a yearly rent of eighteen pounds as herein is mentioned AND whereas all & every the same premises are by assignment of certain mortgages . . . . . down to and vested in the said Samuel Alston for the remainder of two . . . . . Terms of five hundred years and one thousand years for securing payment to the said Samuel Alston his Executors and Administrators on assigning four hundred and fifty pounds and interest for the same now it is agreed by and between the said parties and the said Samuel Alston for himself his Executors and Administrators doth by these presents covenant and agree to and with the said John Alston the Elder and John Alston the younger or either of them their or either of their heirs Executors Administrators or Assigns that if the said John Alston the Elder and John Alston the younger or either of them their or either of their Heirs Executors Administrators or Assigns do and shall pay off and discharge the aforesaid sum of fourhundred and fifty pounds and interest to grow due for the same and also to Francis Green of Preston twenty pounds and to Mary Kirks widow fourteen pounds and interest within the space of four years next ensuing the date hereof then the aforesaid Lease shall be void and of nowe effect from and after one years end after the said four years shall be expired otherwise to remain in full force for the remainder of the said term of one and thirty years.AND it is agreed that the said Samuel Alston shall accept and take the yearly rent and proffits of the premises in leiu of full satisfaction of the yearly interest to grow due on the said assignment of the said mortgages and he the said Samuel Alston his Executors Administrators or Assigns shall not nor will cut or cropp any of the trees growing on the premises within the said term of five years nor afterwards if the said principle money or sum of four hundred and fifty pounds and interest and the said money due to the said Francis Green and Mary Kirks with interest thereof and charges be fully paid off within the said term of four years next to come from the day of the date hereof in . . . . . whereof the said John Alstron the Elder and John Alston the younger hereby covenant and agree and with the said Samuel Alston his Executors Administrators and Assigns maintain and keep all and singular the premises in good substance and condition of all sort of repairs from the day of the date hereof during the term of five years from there next ensuing. Witness their hands and seals the day and year first herein written. 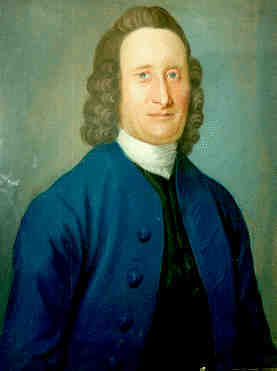 John Alston. John Alston Jnr. An inscription on an Altar Tomb in churchyard of St Mary the Virgin Edwardstone, reads "Here likewise lieth the body of the aforesaid Saml Alston late of this parish Malster,who departed this life the 23rd day of February 1754 Aged 64 years". Tomb located 2000, cleared by Mrs Tregear of Edwardstone, and photographed. His portrait signed Beeston Coyte 1752 was gifted in 2003 by E N A Hadwen (nee Fenn) to Christchurch Mansion Ipswich with the other paintings of the family by Coyte. It is inscribed on the back "Mr Sam Alston of Edwardstone aged 62 Beeston Coyte 1752" sighted E L Fenn 2001. Portrait now at Christchurch Mansion Ipswich SFK. 2004. Small oval oil painting of Samuel & Sarah was given to Charles Alston by Catherine Mary Downing and transferred by Charles Barron Alston to Dr E L Fenn in whose possesion they are now (1907). Whereabouts unknown to researcher E L Fenn in 1998. Will on file, page 162 Alstoniana. There is a portrait of Samuel Alston at Nayland (?) and probate on his will was granted on March 12th 1754 at Bury St. Edmunds. the mercifull hands of Almighty God my Creator. First I give and devise all and singular my Messuages Lands, Tenements, Hereditaments and real estate whatsoever and wheresoever unto my Son Samuel Alston and his heirs for ever. Next I order and direct that all my just Debts be duely paid and satisfied. Then I give and bequeath to my Daughter Sarah the wife of William Sudell of Colchester in the County of Essex Mariner the Sum of One Hundred and fifty Pounds of lawfull money of Great Britain. Also I give and bequeath to my Daughter Mary Alston the sum of two Hundred and Sixty Pounds of like lawful money which said Legacies so given to my said daughters Sarah and Mary I will shall be paid to them respectively by my Executor hereafter named within one year after my decease. Then I give the sum of one Hundred and fifty pounds to the survivor of them the said Sarah and Mary and as to all the rest Residue and remainder of my Goods Chattles, Moneys and personal estate of what Nature or Kind soever and wheresoever after all my just Debts as aforesaid Legacies funerall charges charge of the Probate of this my will and other incident charges are paid and satisfyed I give and bequeath the same to my Son Samuel Alston his Executors Administrators and Assigns provided always and my Will and mind is that in Case my personal estate shall not be sufficient to pay off and discharge my just Debts and Legacies aforesaid that the several Legatees in this my will named shall bear an equal part and share of such Deficiency or Deficiencys in proportion and according to the Bigness of the several Legacies herein before given to them respectively And my mind and will further is that my said Executor shall not be answerable for any loss or losses that may happen in placing out the said sum of One Hundred and Fifty pounds or any part thereof at Interest (in Trust as aforesaid) or in any ways in the execution of this my Will unless the same be caused by their wilfull default or neglect and I do hereby nominate constitute and appoint my said son Samuel Alston sole Executor of this my last Will and Testament and herby revoking all former and other Will and Wills by me at any time heretofore made I publish and declare this to be my last Will and Testament. In withness whereof I have to this my last Will and Testament contained in two sheets of paper set my hand and seal to each sheet and my seal to the Label by which they are affixed together this twelfth Day of December in the twenty-fifth year of the Reign of Our Sovereign Lord George the Second by the Grace of God of Great Brittain ffrance and Ireland King Defender of the faith and in the year of our Lord one thounsand seven hundred and fifty one. Signed Sealed, published and declared by the said Testator as and for his last Will and Testament in the presence of us who in his presence and at his request have hereunto subscribed our names as Witnesses: Martha Bayles Martha Abbott Thos Bayles. Proved 28th March 1754 by the oath of the Executor. Samuel Alston  bap 1680 St Giles Cripplegate LON may be Samuel  ? Did Samuel marry Sarah in London? Access to the Edwardstone Hall archive may assist in confirming Alston relationships in Edwardstone. As far as the researcher is aware they have not been approached for access. The archive was given to the Bury RO at one point but withdrawn in the 1950's. 11 June 1719 Alston (groom) married Light. What role did Rachel Bonner (Bowen) fulfill in the Alston household that she should warrant her portrait being painted with the family by Beeston Coyte in 1754 Her portrait is endorsed "Aged 49 House Keeper to Sam Alston of Edwardston Maltster above 20 yrs. Beeston Coyte 1754"
Edwardstone was once of considerable note, on account of the lords that lived here. In the Conqueror's time Hubert de Monte Canisio, or Montechcnsy, Guarin or Waryn, of this family, was so wealthy, that he was called the English Croesus, and according to Camden died worth 200,000 marks. Here was formerly a religious house, a cell to the monastery of Abingdon, near Oxford j but about the year 1160, the monks were removed to the priory of Colne, in Essex. 1. Beeston Coyte Pastels: of a Yeoman family, 1752/1754, Nayland Suffolk. Article courtesy of Neil Jeffairs - Dictionary of pastellists before 1800.